Known Relatives: Mother, Father, younger sister. All alive. Milla is a superhero on the Justiciars team, fighting for truth, justice, and the American way! Ok, maybe not all of that, but she sure thinks they are. Aside from being an entirely too easygoing superhero, she's also a sophomore (almost junior) in college. She has no idea what she wants to major in, right now. Milla was a fairly normal kid. Always outgoing, she never had problems making friends. School was easy, not so much because she was smart but because she was always popular. Playing soccer as a child and in middle school, she upgraded to the cheer leading squad in high school. Though she never was captain or anything, she was one ‘those girls’ the entire high school career. You know the type…pretty, friendly, popular…the ones everyone envied. As far as grades went, she wasn’t terrible, pulling fairly solid Bs. Might have done better, had she actually spent less time focused on sports and more on learning boring things like history. It was in her senior year of high school that the Shockwave hit. The new mark on the lower right quadrant of her stomach was a shock, and not a pleasant one. High school, even if you were popular, was a tough enough place without randomly developing superpowers. Still, much to her relief, she didn’t develop them. At least not immediately. The mark was in an annoying spot, though. No more belly shirts or bikinis, if she wanted to conceal it. Milla took a couple years off after high school. The young woman wanted to learn more about what she was able to do. Her parents didn’t mind…they hadn’t figured out that she was one of the strange sigil bearers, now, and she didn’t want to tell them. Coming from a solidly religious, middle class background, they wanted nothing more than for their daughter to live the American Dream. Get a good job, meet a nice boy, buy a house with a white picket fence and have 2.5 kids and a dog. Milla didn’t want to spoil their visions of her future. When she started college, she had no idea what she wanted to do. In truth, she didn’t choose her college for the courses or the academics. No, she chose it for location: New York City…where Kerberos Group was located. She had seen the Justiciars on television, and on radio. Heck, there probably wasn’t anyone in the country who didn’t know about them…and who wouldn’t want to be a superhero? It was at the end of her freshman year that she went and applied. Being accepted was something she had hoped for, but certainly never expected. Granted, she didn’t know anything about fighting, but they were willing to teach her, and she was more than happy to learn. Now she’s a sophomore in college, still cheer leading, and working as a superhero on the side. What more could a girl want? Milla is friendly, trusting, and generally your average person who has had no contact with the nastier part of life. Sure, she knows she’d probably be ostracized if anyone found out she was a sigil bearer, but she doesn’t worry about it. Just makes sure her clothing covers it at all times. It does make boyfriends a bit difficult, though. That’s probably what she misses the most…aside from not being able to wear a bikini. She admires those who are ‘saving the world’, especially ones like the Justiciars. Like many people, she bought the ‘wholesome superhero image’ hook, line, and sinker, and is proud to be a part of it. Milla genuinely believes they’re making the world a better place, one bad situation at a time. Naïve would (obviously) be a good term to describe her. She has no idea what it really is that she’s mixed up in. Being told the risks and actually seeing the consequences are two very different things, after all. It’s the world of difference between intellectual and emotional understanding. Violence does not come naturally to her, and while in costume she’s quite happy to follow the lead of the more experienced members. Though by no means a coward, she fully subscribes to the ‘no kill’ philosophy of the group. Deception is probably the only thing she really doesn’t like about the life she currently lives. Lying to her parents, and to the rest of the world, is hard. It’s not that she has any interest in fame. More that she just wishes she could be honest with the people around her. Even so, life is a strange and wonderful adventure for the young woman. Milla bears a sigil of light. It can be utilized many ways, the easiest being to simply generate light from a part of her body. This can be anything from a gentle glow to an intense flash of light, bright enough to temporarily blind. The second thing she found she could do with it was to actually bend light around her in such a way to hide her from view. This has, through training, been expanded to cloak entire areas around her, including people or even an entire vehicle. Theoretically she could hide something much larger, but the effort would be immense and likely take her out of action for a while afterwards. The cloaking ability works best if everyone is still, but can function at speed. It’s simply more taxing for her to do such a thing. Though she can project the field within her line of sight, she must pick a point of origin in order to generate the field, and cannot pick and choose what inside the field is hidden. The only real offensive ability she has is to generate beams of concentrated light in varying intensities. Lasers, useful for targeting, blinding, cutting…or killing. Not that she would ever use them for the last purpose. In theory, she understands it is possible, but the idea is rather abhorrent to her. Milla is one of the superheroes in the Justiciars team. She’s chosen the name ‘Photon’, in keeping with her light abilities. 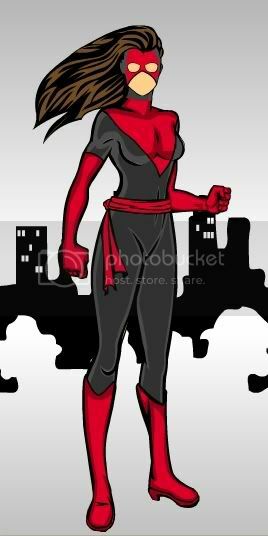 Her costume consists of a dark grey base with red highlights, and an upper facemask. Concealing her identity is very important to her, largely due to the fact she does not want her family finding out what she does.